'Down Under World', one of Christian Thompson's eight images from 'We Bury Our Own'. A portrait of one of England’s most important religious figures - Cardinal Henry Newman, beatified by Pope Benedict in 2010 - has been placed in storage to make way for an Aboriginal artist's self-portraits. It's all happening in the 400 year old Dining Hall at Trinity College Oxford, and the iconoclast from Australia who's causing the upheaval is Christian Bumburra Thompson, one of the first two Aboriginal students to go to Oxford on Charlie Perkins Scholarships. Appropriately, the recolonisation occurred on Australia Day! He's also been turning the tables at the University's Pitt-Rivers Natural History Museum – taking images and items collected by ethnographers in Australia and reimagining them in an exhibition called "We Bury Our Own”, consisting of eight large photographic self-portraits and a video installation. 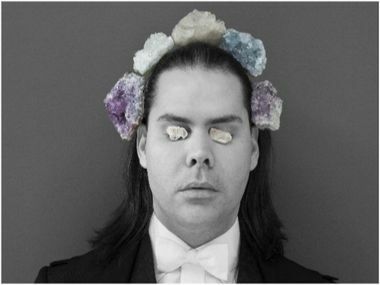 “I conceived the series in 2010 after curator Christopher Morton invited me to develop a body of work that would be inspired by and in dialogue with the Australian photographic collection at the Pitt Rivers Museum,” Thompson explains. “I knew that this would be a fantastic platform and unique opportunity to engage with the collection, and to make a vital contribution to the cultural fabric of Oxford University, to create a new gateway to consider such material”. Thompson’s haunting series of self-portraits are the result of a meditative journey into the inner psyche of his ancestry. Through a series of ritualistic pilgrimages, Thompson recalled the lives of ancestral beings while initiating a new narrative that links the past with the present. His portraits ask the viewer to consider the implications of the events of the past through the combination of historically symbolic objects and references to contemporary culture. “Perhaps this is what art is able to do”, he continued, “perform a ‘spiritual repatriation’ rather than a physical one, fragment the historical narrative and traverse time and place to set something free, allow it to embody the past and be intrinsically connected to the present?”. Back at Trinity where Thompson is a DPhil student, its President, Sir Ivor Roberts explained, “We were delighted to admit Christian in 2010, a young artist with a growing international reputation. And to support him, the Fellows of the College agreed unanimously to make the Hall available for this exhibition. Christian’s work is undoubtedly contemporary and strikingly different from the formal portraits that people associate with Oxford colleges. 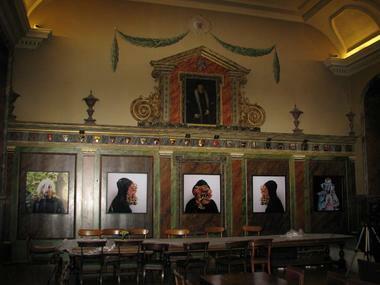 I doubt that many or any college Halls will have been transformed in the same way as Trinity’s. Christian’s work is highly individualistic and yet was received extraordinarily enthusiastically by the Trinity community and by our many visitors. One or two were surprised (shocked would be too strong a word) by the striking contrast with the works they replaced, but the overall assessment was overwhelmingly positive”. The portraits of two former British Prime Ministers - Lord North and William Pitt the Elder - along with General Ireton, one of the Parliamentarians who signed King Charles I’s death warrant, and Cardinal Newman were all despatched from the walls for the two weeks following Australia Day. Meanwhile, it's an extraordinary year for the 34 year old artist. In February his work was seen in New York as part of the Visions + Voices Australia event at NYU. In March, he moved South in the States to the Kluge-Ruhe Museum at the University of Virginia. In September, he's been selected as one of Australia's leading artists to appear at the Royal Academy show of landscapes in London. Back home, in April, Thompson appears in the group show at the Anna Schwarz Gallery in Sydney, and in May at the AGNSW. Then in October, we finally get a solo show of new work in Australia at Gabrielle Pizzi's Gallery in Melbourne. Will he be a Doctor by then? And will he ever get his portrait permanently on show in the Trinity College, Oxford hall? 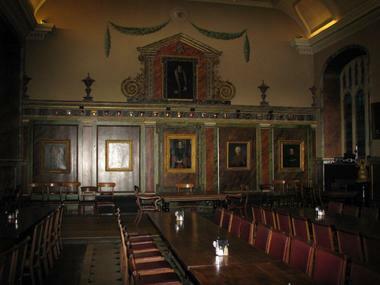 The Dining Hall at Trinity College, Oxford before renovations.